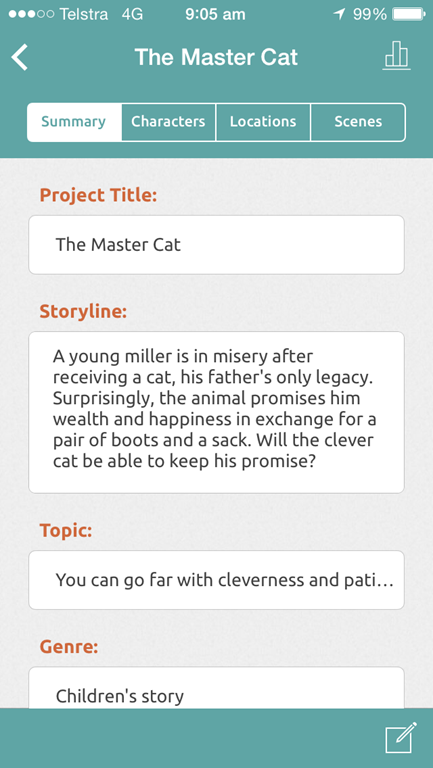 For this week’s #52Tech post I will profile a new writer’s app on the block – Story Planner for iOS. 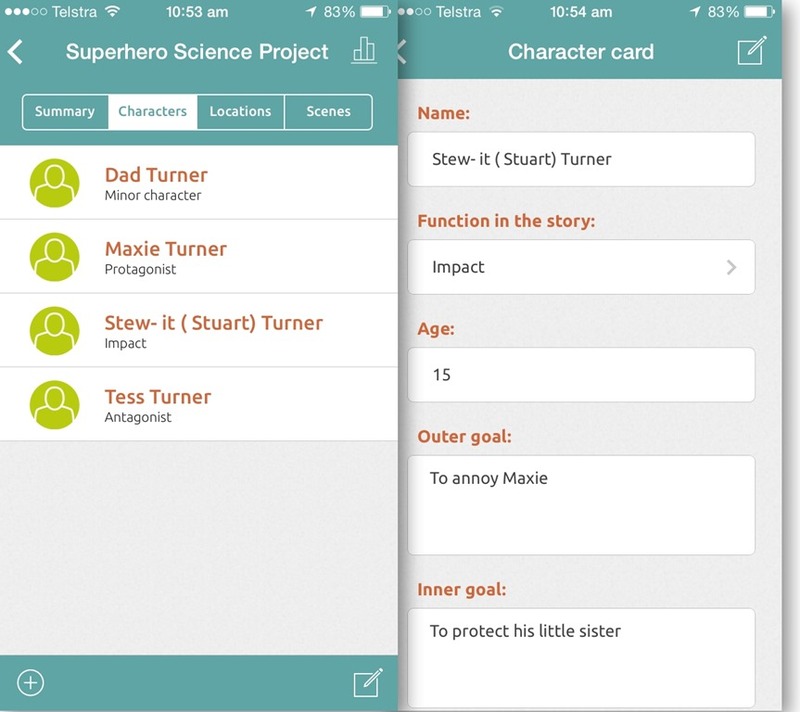 Story Planner has been brought to you by Literautas, the makers of the two writing challenge apps previewed here in January and iDeas for Writing discussed last year. Story Planner is a simple little app, exactly what I needed when going into ideation phase in May for a novel I was playing around with. Although most of my ideas are mapped out via various desktop and ipad apps and physical notebooks, there are many times when I am out with only my mobile phone on me, and want to remind myself of a particular character or get down a quick scene or location idea. This review was done on the iPhone app a week ago, although since then Story Planner has had two developmental updates and is now iOS universal. At this point, however, there is no way to share data across the iOS platforms, so you’ll need to choose the device you are more likely to use for planning your story. This screen provides you with fields for the project title, storyline or synopsis (a few sentences), topic (theme), genre, and a larger Plot field. The character summary screen provides a list of characters and their function or role in the story (you can select from the pre-populated archetypal function- I would prefer to have this a freeform entry to allow for more roles). Inside each are the Character cards where age, goals (both outer and inner), description, story arch or evolution, psychology and biography (backstory) of the character can be input. There is also a notes field. The main screen also shows an icon for the character – it would be nice to be able to upload a small image to infill this field, or within the character card itself. The Locations screens are similar to that of Character with a summary list and Location Cards. Location Types can either be exterior or interior. Once again, I would prefer to have this an editable field to allow for more customisation, and an image field would again be helpful for location. Description and notes fields are available on the Location Card. Scenes are broken out into a summary screen and Scene Cards. Within the Scene Cards, there are several pre-populated fields or selection fields as well as text fields. Scenes can be applied to an Act – but you can choose from up to Act 12. Point of view is a freeform field. 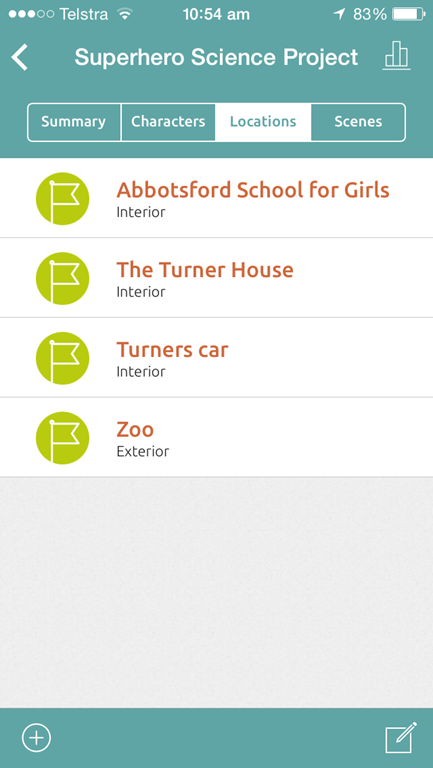 Characters and Locations can be selected from those you’ve predefined in the appropriate tabs. Type of scene is limited to either a reaction or action scene (I would prefer customisation abilities). Scenes can have a date/time input – start and end, with a selection calendar for dates and another field now for time (this has just altered in the latest upgrade, making selection of large timeframes much easier. Scenes require a Plot number, choosing from up to 12 plot-lines etc. The issue here is that there is no plot tab so if the writer does run with multiple plotlines or subplots to track, these will need to be remembered or written down elsewhere. The Rising Action field is also pre-filled with quite a few plot point labels such as inciting incident, climax, falling action and exposition versus description. It would be helpful if this filter was editable and also multi-select was allowed on these. The description field is one of the last on the Scene card screen, although this, along with the plot number and scene title is what appears on the Scene summary or master list. 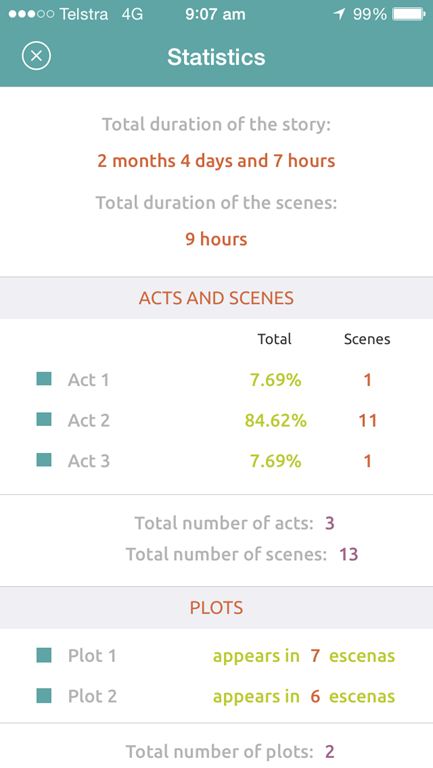 The scenes can be reordered (or deleted) in this summary screen, although take note of the start and end dates for individual scenes as this has a bearing on statistics. 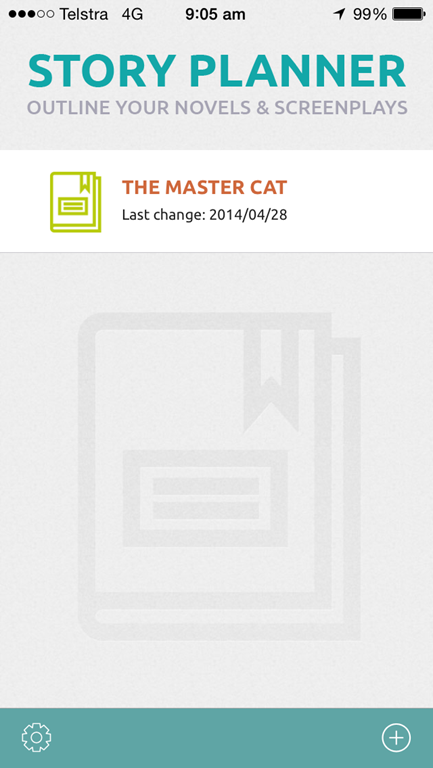 Story Planner comes with one example project – ‘The Master Cat’ and settings to change from English to Spanish language. Although designed as a simple planner app – which Story Planner does well the app also provides some helpful tracking statistics. The top stats track length of story (in terms of story event days and hours) – ‘The Master Cat’ takes 2 months and 4 days over the year 1342. Of help is the data collected of plots, characters and locations to scene count. So if you follow one of the many story structure / beat sheet type methodologies (I would recommend visiting Jamie Gold’s site, where most of the main ones have been put into spreadsheets for you) and want to see if your minor subplot is taking over too much of your story, then Story Planner does provide a quick look at this. Top five locations are also tracked, as are how many scenes your characters are involved in. The app costs $1.99. My copy was a review copy obtained via a promo code sent to me by Literautus. My verdict: The stats are really helpful for spotting trends in character or location usage against scenes or beats. 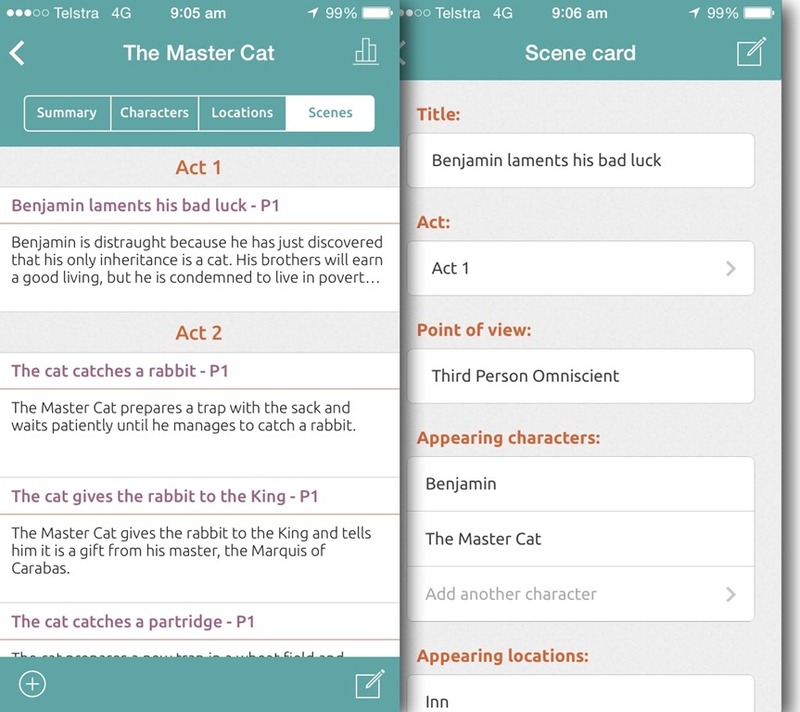 With several functional additions such as access to add to database fields, a plot tab and data movement or sync across devices and to other apps, Story Planner has the potential in the future to fulfill my own full mobile story planning needs. In the meantime, many of the app functions are useful for drilling out initial thoughts, and creating characters and scenes on the hop.